Questoverseas: Thank you Zoe, Villa Maria will miss you! 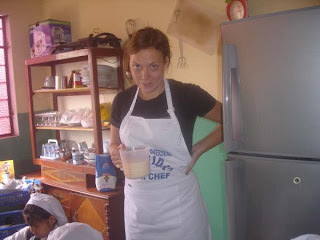 Zoe McGivern, pictured above sharing her fantastic cooking skills during the first cake making lesson at our Villa Maria school in Lima, Peru, has been supporting the teaching programme out there since September last year. Her main work has been teaching English to the school kids, aged 3 to 7, but that has been far from the full story of the help she has given. Building houses for single mothers, working in the community nurseries, helping in after school homework, sport and dance classes, helping to raise over £5,000 to pay for a young girl's life saving operation, and keeping the school dog Nena fit with her daily runs around the nearby track are just a few of the achievements she can boast. She has unfortunately had to cut her time there short by a couple of months, due to a family illness back in the UK, but thanks to the tireless effort you have put into your time there Zoe, you have a home and a family waiting for you in Peru whenever you have the chance to go back - thank you! This does mean however, that we are in need of an English teacher at our project in Peru. Whereas we normally put together teams of volunteers for our projects, this is a bit of a one off for us, so we are keen to find the right person. If you think you can help, have a look at the details of our Villa Maria Project and contact us with any further questions. Here is a video the kids put together for Zoe to say goodbye - very sweet!